This is a guest contribution from Dynasty intern, Scott Britton. Taking a 0-28 team to a 15 win season in less than four years is an accomplishment that is pretty hard to miss. This is something Horace Broadnax was able to do with the Savannah State University men’s basketball program. Something even more compelling was Broadnax’s ability to do this with the second lowest basketball budget in all of Division I (339 out of 340)! But what does it really mean in comparison to the rest of college basketball? 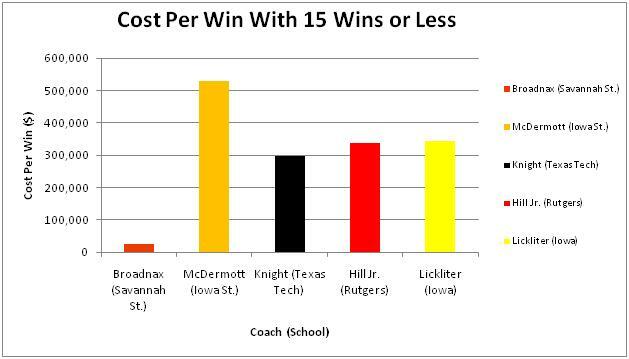 Broadnax’s 2009 season produced argubly the best Dollar-Per-Win ratio in modern college basketball. With 15 wins and a budget of $376,968, it came to roughly $25,131 per win. This may sound like a lot, but when you compare Coach Broadnax to his colleagues it is pretty apparent he may be the best bang for your buck in college basketball. 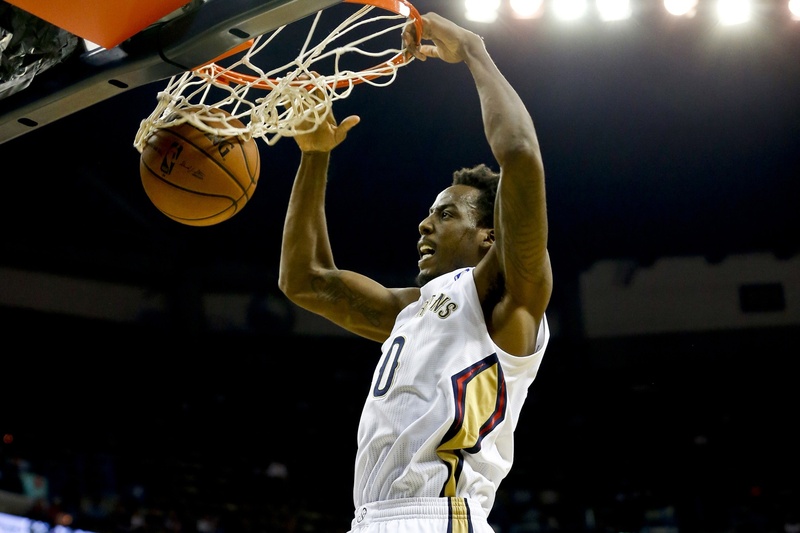 Compared to the likes of big names like Howland, Williams, Self, and Donovan, Broadnax’s productivity is astounding. The bottom line is for less than one tenth the cost of the coaches just named, Horace Broadnax can get you a win. One point of hot contention is whether completely turning around a program or doing it on such a meager budget is greater accomplishment? Regardless, Horace Broadnax has proved himself amongst the coaching ranks. It is hard to imagine what this guy could do with a little financial support and a program with an already well-established tradition as some of the heavy hitters listed above possess. The only disparity in Broadnax’s case is in the wins columns. His 15 wins is less than the generously budgeted basketball powerhouses mentioned above were able to achieve. 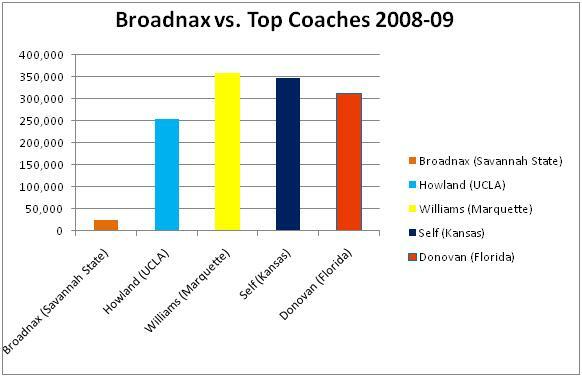 This raises the question, how did Broadnax compare to coaches with the same number of wins? Above is a chart reflecting teams with similar records to Broadnax’s tigers in 08-09. Remarkably all these team except for one spent over ten times as much on their programs to achieve the same number of wins or less. This is reflected in the average price per win column. 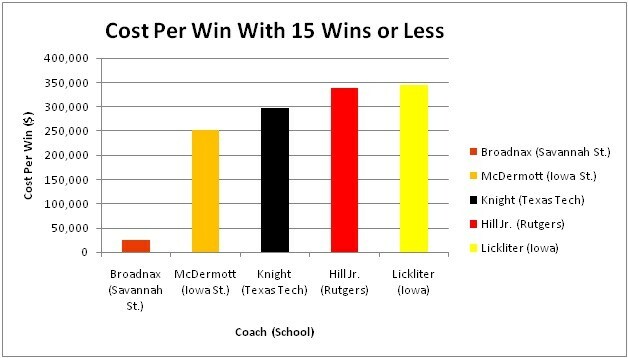 Broadnax’s price-per-win- was at least 1/11th the cost than that of Knight, Hill Jr., Lickliter, and McDermott yet he was able to win at least as many games as these coaches. In the case of Iowa, Broadnax’s price-per-win was less than 1/13th the price-per-win of Todd Lickliter! Looking at the schools, it is evident there is a disparity in conference schedule strength. However, considering the talent and funding these programs receive compared to Savannah State, Broadnax and the Tigers greatly outperformed in comparison. All of these schools are ranked in the top 65 in division one funding compared to Savannah State’s 339th ranking, yet the win column is the same? Clearly, Broadnax has done a superior job coaching Savannah State and making the most out of his situation. Let us take the analysis a step further and make it even more relevant. How does Broadnax compare to a set of mid-major programs with similar RPI and even similar athletic budgets? Take the Mid-American Conference (MAC) Western Division. During the 2008-09 season, all six head coaches in the division failed to lead their programs to as many wins (15) as Broadnax did. Despite the lack of financial support, Broadnax maximized his resources by winning 15 games and achieving a winning season at the University for the first time in 25 years! This is clearly a testament to Broadnax’s coaching ability and resourcefulness. Broadnax’s ability to make a lot of out a little makes him an attractive pick for athletic directors. His average price-per-win (basketball budget/total wins) was a mere $25,131. 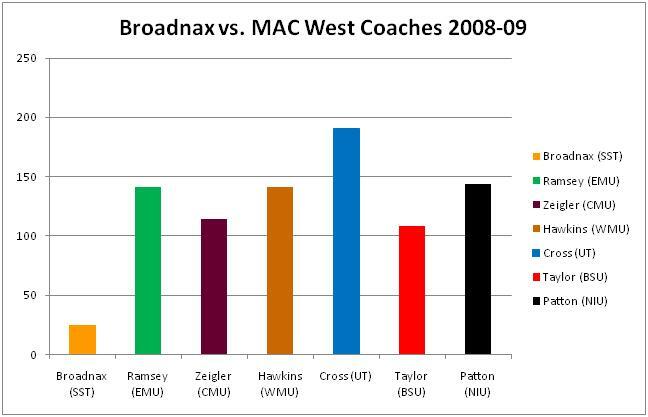 Comparing Broadnax to coaches in the MAC conference whose budget was at least 3 times the size of his reveals just how impressive a feat this really was. He won more games than any MAC West coach and his price-per-win was less than ¼ of all MAC West coaches last season. The numbers don’t lie. Skeptics of Broadnax’s accomplishment will point to the disparity of competition between Savannah State and MAC West teams. Yet such an assertion is completely false as Savannah State ended with a higher RPI (255) than its closest competing MAC West School, Ball State – a 262. In fact, Savannah’s RPI finish was well over 50 spots higher than the MAC West average because of a stronger-strength of schedule. This makes their 15-win season all the more impressive when weighed against the MAC West schools’ performances.